Recently, I brewed an American style wheat beer. That may sound boring to some, but this beer will soon have an exotic addition: Passion Fruit! What is passion fruit, well? from Wikipedia, it’s the fruit of the passion flower. If you’ve never had passion fruit in some form, it tastes like tropical, fruit-y goodness. Surprisingly, they are grown in the US, obviously in the tropical areas. This beer was inspired by Wailua Ale, a wheat beer brewed with passion fruit by the Kona Brewing Company in Kona, HI (the Big Island). 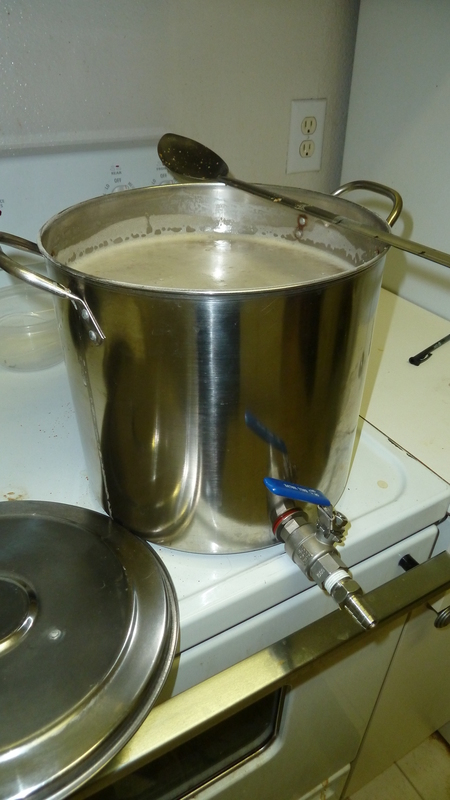 This blog post summarizes the brew day of the Passion Fruit American Wheat beer. Largely, in this post, recipe design and brew day glory are discussed. Additionally, as requested by follower homebrewedhappiness, included at the end of this post is the recipe. Look for fermentation and packaging updates. Cheers, and happy brewing! 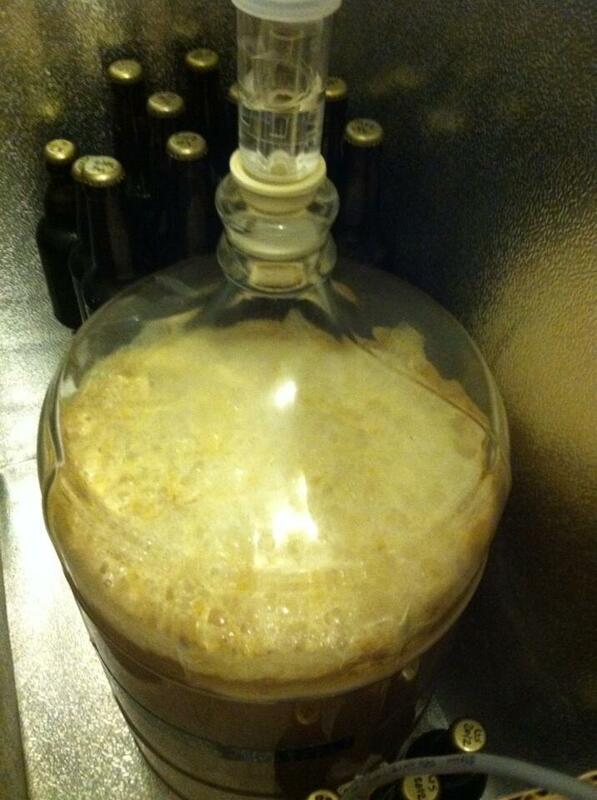 UPDATE: 03/18/2014, Fermentation details, see below. Simply stated, the Passion Fruit American Wheat is a fruit beer, combining a basic American-style wheat beer recipe with passion fruit added in the secondary. For grist formulation, I used a very basic American wheat beer recipe, essentially a 50/50 wheat to pale malt mix. Depending on your palette, American wheat beer grists can be varied, such as 60/40 or 70/30 wheat to pale malt, closer to Hefeweizen territory. Alternatively, I have seen reverse wheat beer grists brewed commercially, most notable Schlalfy in St. Louis, MO, which uses a 30/70 wheat to pale malt mix. I say pick which ever suits your palette best. For me, 50/50 works best. Passion fruit juice by Fast Fruit; it tastes nice! As I previously posted in Award-Winning Apricot Wheat, fruit in beer can be tricky business. For “standard fruits” like apricot, berries, etc, high-quality, sterile fruit purées and fruit extract can be readily purchased at your local homebrew store. However, more tropical and exotic fruits, like passion fruit, aren’t available in homebrew-ready forms. Therefore, some passion fruit based research was necessary. 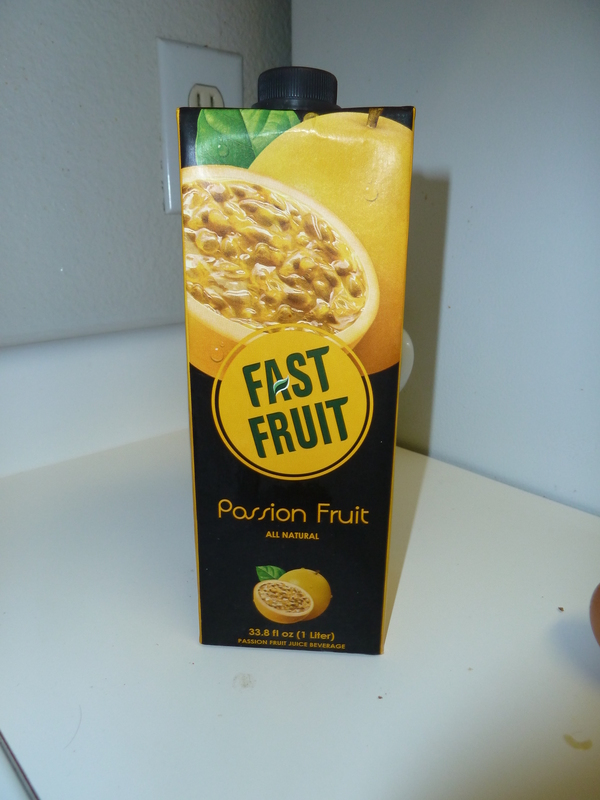 After a bit of research, I found a good quality passion fruit juice in the form of Fast Fruit. If you can find it, Fast Fruit is a line of juices that specializes in shelf-stable tropical fruit varieties. To test its quality, I did a two-part juice tasting. The first part was tasting the bare juice (duh?!). The aroma was just perfect, just how I remember in Wailua Ale, very tropical and sweet, bordering on musty. Also, in tasting, the juice was very tasty, loads of passion fruit goodness. The second part was tasting the juice in a beer, to estimate the fruit impact in a beer. Since I didn’t have any wheat beer on hand, I added it to a blonde ale I did have, figuring this would work as a close analog. I found through trial and error (and lots of beer drinking!) that an ounce of juice in a twelve ounce serving worked very well, balancing the beer flavors with the passion fruit presence. Adding this unfermented juice did add some extra sweetness I did not care for, but since the juice is mostly fermentable sugar, this flavor will likely disappear in the final product. Based on these tastings, I determined that 2L of the Fast Fruit passion fruit juice should work well as the fruit addition in a 5 gallon batch of wheat beer. Also, from the nutritional information provided, the 2L addition adds roughly 10 ounces of sugar to the final recipe, adding around 1.005 gravity points to the resulting brew. The boil was pretty simple as well. Just bring the wort up to a gentle boil, add Magnum hops to get you to 20 IBU, then chill. I use a water/ice bath combo, each with 5 gallons of water. Through this, I’m able to chill 5 gallons of wort from boil to 62 F in 40 minutes, and I’m happy with that. Pitch 1 packet of US-05, shake the carboy, and you’re done. I’m currently fermenting this one at 68 F in my fermentation chamber. I will update this post when fermentation visibly slows and transfer to secondary for the passion fruit addition is ready. Primary fermentation was pretty standard for the US-05 yeast strain. After a good pitch, fermentation was active at 24 hours. High krausen was reached 48 hours after pitching, and no blow off tube was necessary. After 5 days, fermentation visibly slowed, but still with krausen. Seven days after pitching, the krausen fell. This is my cue to rack to secondary for passion fruit addition. The entire fermentation was temperature controlled at 68 F, my go to fermentation temp for the Chico strain. Look for updates for racking and secondary fermentation. Cheers! We can get a couple of Kona beers here in Korea, but they’re about $5.00 a bottle. I’ve had Longboard Ilsand Lager and Pipeline Porter, while visiting Oahu years ago. Enjoyed the read!!! A friend and I recently began ‘apartment’ home brewing as well. I’ll be posting up about it soon Cheers! Great to hear! Let me know how your brews have been turning out. Cheers! Check out this recipe from our friends at The Apt Home Brewer! Thanks for the reblog! Cheers! « How Low Can You Go? 2% ABV Session Amber!